Friends beloved dog ‘Misty’ died this week so I felt I wanted to do a pet portrait for them so they could always remember her. 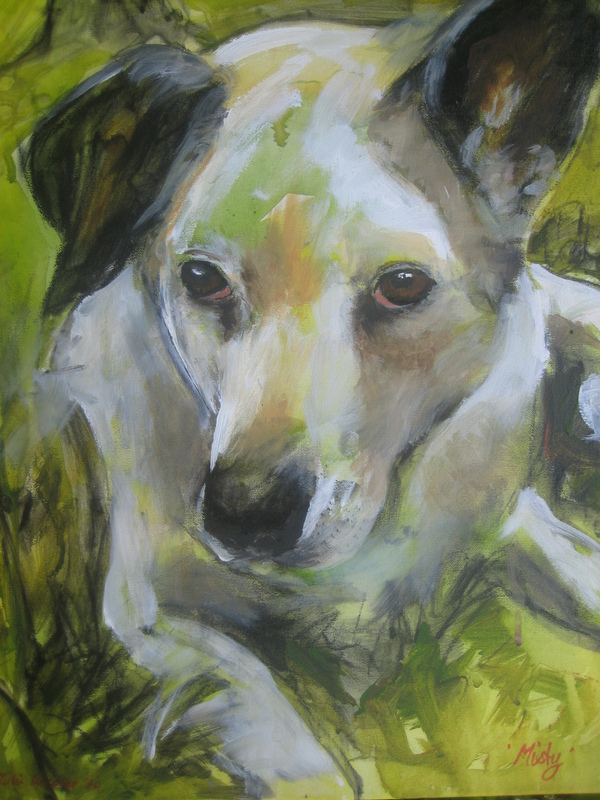 I had been to a Don Waters class during the week and he demonstarted by doing a portrait of his dog, a dashhound. The most important thing to get right is the eyes as these are the focal point and what people remember most about their pets. It was fun to do so I may do one of our dog Zebedee next. 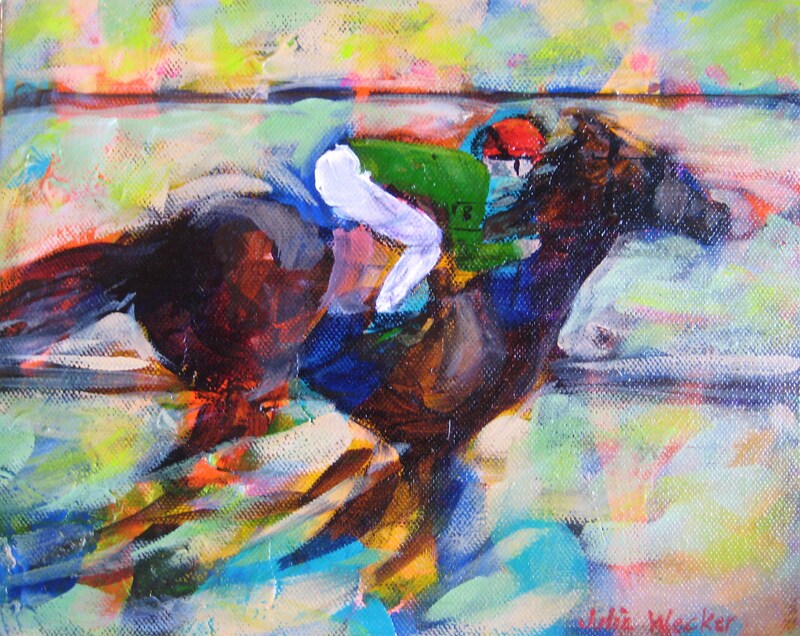 I sold this painting recently at Seaside Artists Gallery and there is an interesting story to it. A few years ago the farmer in me bought 2 ducks and a drake for the backyard.Possibly not the wisest thing for a suburban block. They proceeded to be an extremely fertile triple and we were soon overrun by ducklings. 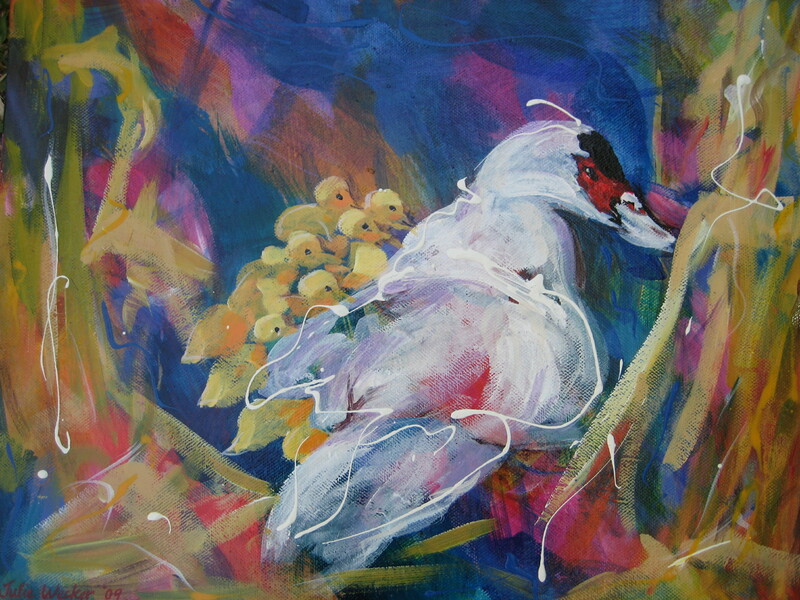 This paintings is from a photo of one of the mothers sittings with her 15 ducklings. We sold most of the cute ducklings to the pet shop but kept 4 of them only to find that they did not stay cute for very long and coated most of the backyard with slippery,slimy fertilizer. Needless to say we felt a better place for them was the freezer. So safely in the frezeer they went and off we went on holidays. While we were away a storm took out our electricity and we came home to a dreadful mess of thawed out ducklings from a defrosted fridge . Our ducklings had to be buried in the backyard. The mother ducks and drake were relocated to acreage and I’m sure have had a few more ducklings since.